University of Illinois at Chicago researchers report new research showing that a number of 2D materials, when incorporated into experimental lithium-air batteries as the catalyst, enabled a battery to hold up to 10 times more energy than lithium-air batteries containing traditional catalysts. 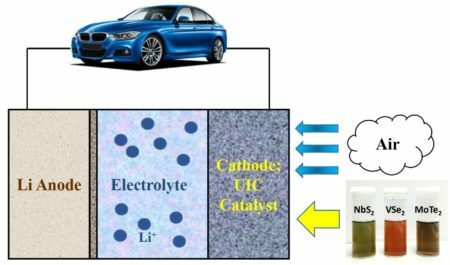 2D catalysts power an electric vehicle. Image Credit: Amin Salehi-Khojin, University of Illinois at Chicago. Click image for the largest view. Salehi-Khojin and his colleagues synthesized several 2D materials that can serve as catalysts. A number of their 2D materials, when incorporated into experimental lithium-air batteries as the catalyst, enabled the battery to hold up to 10 times more energy than lithium-air batteries containing traditional catalysts. Their findings have been published in the journal Advanced Materials. One of the reasons the 2D TDMCs performed so well is because they help speed both charging and discharging reactions occurring in lithium-air batteries. “This would be what is known as bi-functionality of the catalyst,” explained Salehi-Khojin. “The 2D TDMCs and the ionic liquid electrolyte that we used acts as a co-catalyst system that helps the electrons transfer faster, leading to faster charges and more efficient storage and discharge of energy. These new materials represent a new avenue that can take batteries to the next level, we just need to develop ways to produce and tune them more efficiently and in larger scales,” Salehi-Khojin said. This report strongly suggests that this technology could be quite close to going for scaling up. Thus, a listing of the team members: Poya Yasaei, Zahra Hemmat, Pedram Abbasi, Shadi Fuladi, Xuan Hu, Robert Klie, Fatemeh Khalili-Araghi and Baharak Sayahpour of the University of Illinois at Chicago and Robert Warburton and Jeffrey Greeley of Purdue University are coauthors on the paper. The battle seems joined – lithium air and lithium metal plus other chemistries. Go folks! World economic progress needs your success.